Verbind was a software company with a funny Dutch name. To build recognition, I suggested a simple two-finger mnemonic (no shortage of public domain endorsers) and a cheeky headline. The small pinhole in this flyer demonstrated the incision area needed for Boston Scientific's groundbreaking surgical devices -- and pointed the way to careers that saved lives and reduced trauma. Overcoming a name that seemed to favor science majors, Boston Scientific used this award-winning campaign to show liberal arts students that passion and initiative were key job qualifications. This award-winning site for a maker of minimally invasive medical devices used a"Small Openings, Big Careers" theme to show liberal arts students that any major can make major breakthroughs. Actually daring engineers to join General Dynamics, this ad spoke to those excited by the challenge of designing battlefield products capable of surviving a nuclear strike. 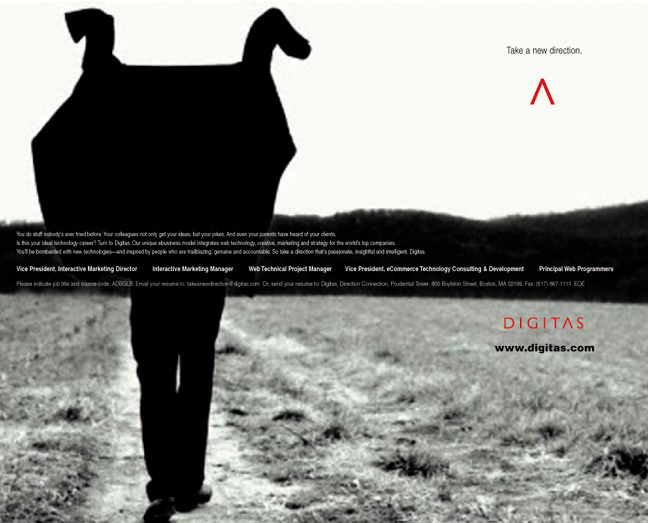 The tipi-shaped "A" in the Digitas name inspired this "Take a New Direction" recruiting campaign, supporting a recent rebranding and showcasing careers on the rise. It's daunting to do ads for a company that was itself named one of ADWEEK'S top interactive agencies. But this interim campaign after a name change projected sophistication and assurance. 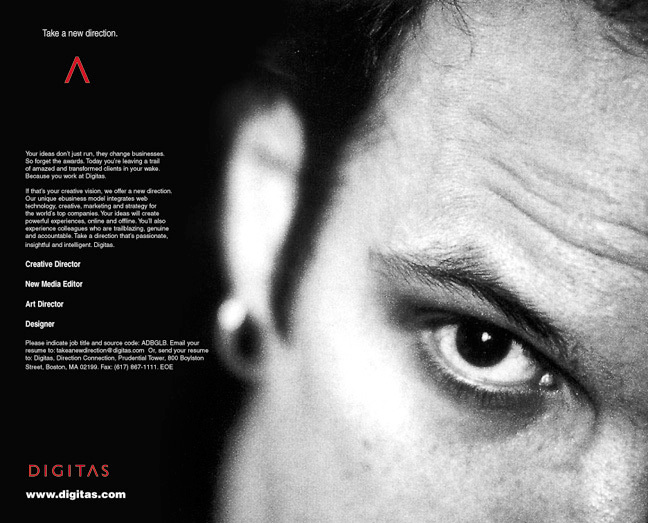 Campaigns dictated by vision statements are always risky, but these ads expressed Digitas' "passionate, insightful and intelligent" mantra in a way that welcomed quirky and offbeat prospects. 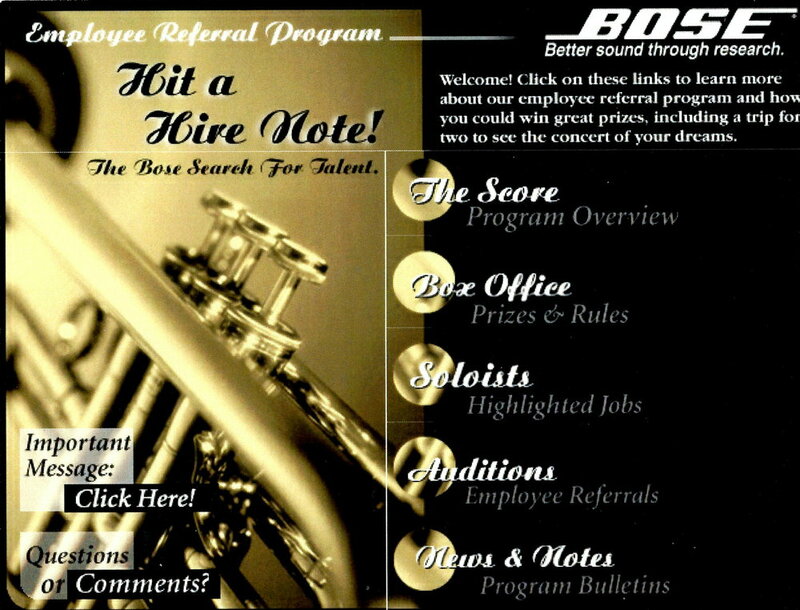 "Hit a Hire Note" used Bose's cultural emphasis on sound and music to reward employees for referring top hires. Concerts, trips and huge cash prizes underscored the competition for techs in the dot.com era. Devising Employee Referral Programs (ERPs) to motivate employees was a fascinating challenge. Anything was fair game in a landscape where an elite engineer could fetch a $25,000 referral bonus. TMP/Monster.com was my first job in which printed collateral was the exception rather than the rule. This rack brochure for job fairs emphasized opportunities at one of Boston's top banks. FleetBoston was born in the megamerger of Fleet and BankBoston, emphasizing careers of dynamism, power and expertise. I later applied this to a recruitment theme: "How Money Moves." A slideshow with details on my recruitment projects, plus an article explaining my Bose "Hit a Hire Note" work.